Jean-Bertrand Aristide, a Roman Catholic priest of the Salesian order who later turned into a Haitian politician, became Haiti's first elected president by winning the Haitian first free democratic election between 1990 and 1991, with 67% of the votes and became the President of the nation on February 7, 1991. However, he was deposed on September 30, 1991. 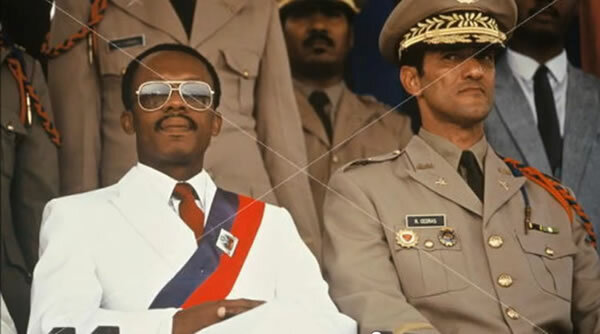 Aristide was ousted in a coup led by Haitian Army General Raoul Cédras, Army Chief of Staff Phillipe Biamby and Chief of the National Police, Michel François. His life was saved by the intervention of the US, French and Venezuelan diplomats and he was sent into exile. He lived in there until October 15, 1994, when the Haitian military, faced with a U.S. invasion under Clinton, agreed to let Aristide return to power and he resumed his presidency. Later, some declassified documents showed that the CIA and other US groups helped to create and fund a paramilitary group called FRAPH (Front for the Advancement and Progress of Haiti). Its goal was to undermine support for the popular Catholic priest Jean-Bertrand Aristide, who was a vocal champion of the poor and disenfranchised. The paramilitary group rose to prominence after the 1991 military coup that ousted Aristide in September 1991. Emmanuel Constant, the founder of FRAPH (FRAPH was nothing but a Haitian death squad) was on the Central Intelligence Agency (CIA) payroll as an informant and spy in early 1992. He later reported that US Central Intelligence Agency agents were present with Army General Raoul Cédras at the army headquarters during the coup, although the CIA denied any prior knowledge. Before the coup, Cédras and François received military training in the United States. Aristide became president again from 1994 to 1996 (12 October 1994 - 7 February 1996) and from 2001 to 2004 (7 February 2001 - 29 February 2004). However, Aristide was ousted again in a 2004 coup d'état, led by one of his former army officer Guy Philippe. In 1994, President Aristide was not overthrown by Guy Philippe who was just an insignificant idiot playing with wooden soldiers.